We sell a CO2 regulator, however we do not sell the C02 cylinders or cartridges themselves. 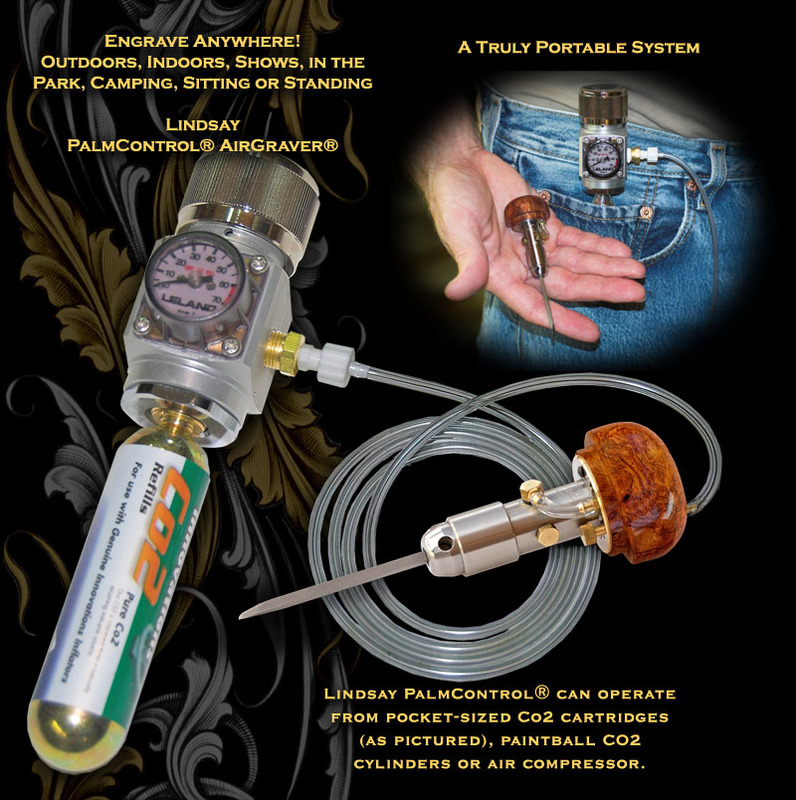 The paintball cylinders are refillable. For this you will need to find a local store in your area that will refill them. Sporting goods stores that sell paintball guns may be a source. We have found $3-$4 is the going rate for refilling. 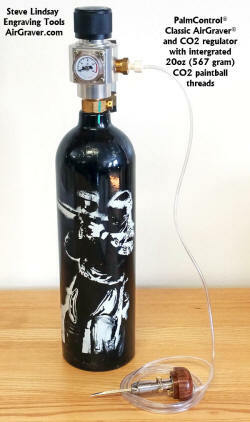 We have also found that for a weekend of engraving at a show we use about a bottle a day of the 20oz paintball cylinders. 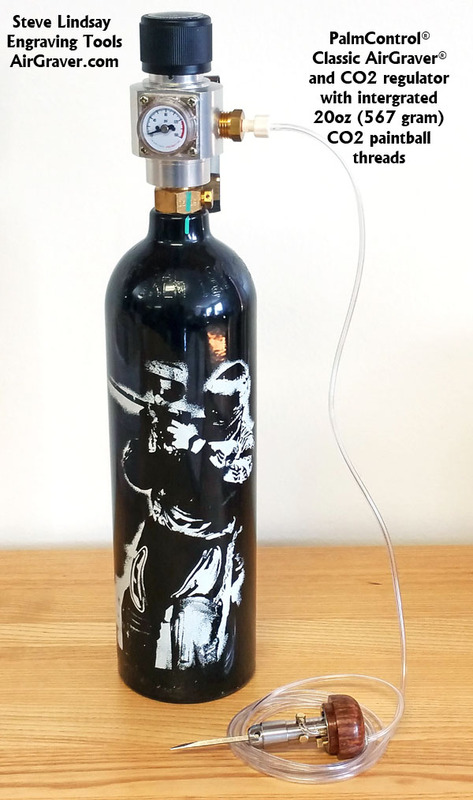 The 20oz bottles can be purchased empty at Amazon.com or locally at a store that sells paintball guns. Amazon also has the 16gram small cartage sold in packs. Here is an Amazon search for them. The 16 gram cartridges are not refillable. A bicycle shop may also carry the 16 gram cartridge to refill bicycle tires. Businesses that sell pellet guns often also carry the cartridges. 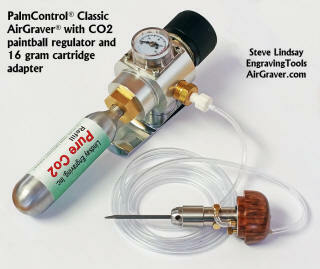 Note: It is not recommended to power the Nitro-G20 with CO2 as its use drains cylinders quickly. An air compressor is best for the Nitro-G20 for that reason. 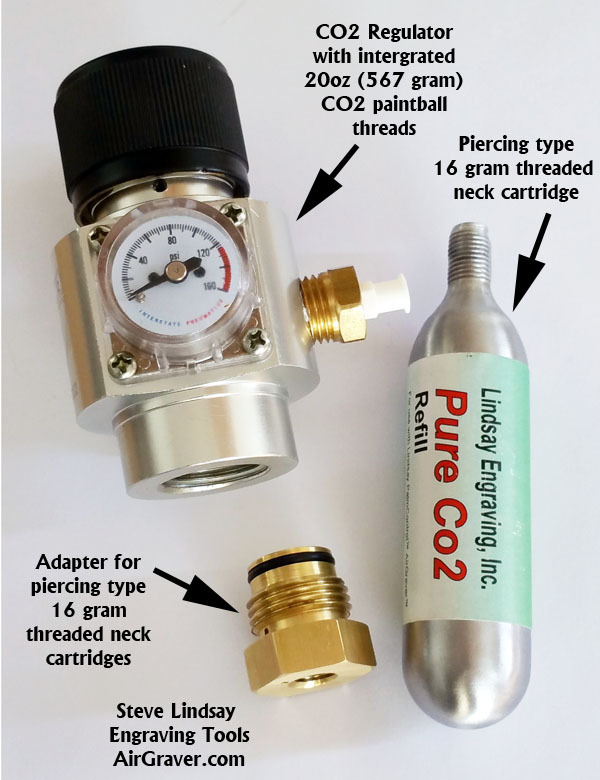 How long a CO2 cartridge or paintball cylinder will last powering a Classic PalmControl can vary depending on what you are doing. ie cutting normal depth or heavy depth cuts. There is a thread on the engraving forum about the amount of CFM volume the AirGraver uses at this link. Generally the 567 gram (20 oz) cylinder last around 8 hours and a 16 gram cylinder 20 minutes. Adapter for the piercing type 16 gram threaded neck cartridges. It has an internal probe in it that does the piercing.